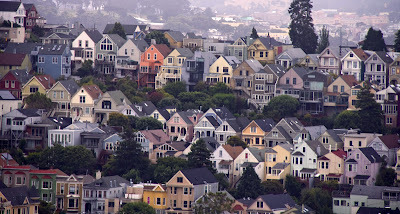 An urban hike onto the hills of San Francisco, one can see how packed the houses are in the city. Each one is unique in color, shape, or decorations. Your neighbors can hear you and you can hear your neighbors. That is life in the big city. In the big city it is indeed very crowded but San Francisco is one of the few major cities in the US which I could consider to live in. The houses look crowded, but people may not be close. I think they look great, if a little cramped. There's nothing worse than rows and rows of regimented boring grey houses all the same color. City life may mean crowd but one can feel alone there. Each house has the uniqueness of its owners. I like that. Nice pic, when land is dear, the living quarters get close. Filip: I'm glad to hear you would consider SF to be home. The weather is usually pleasant, if you like fog and a little on the cold side. Rainfield61: You are so correct. It's usually the crowded towns that make it a lonely place. Ryan: It's usually the older homes that have character. The new homes they build nowadays all look the same. Lina: There is positives and negatives to living in the city or rural places. Yes, one can get lonely in the city, but in a rural community, there is no privacy. EastCoastLife: Feel free to paint and decorate your house anyway you would like. Yogi: There is not much empty space in SF. That's why housing here is so expensive. Life in Tokyo is crowded, too. I love how pretty and unique they all are. Shots like this really make me want to visit SF and they remind me of Charmed too.